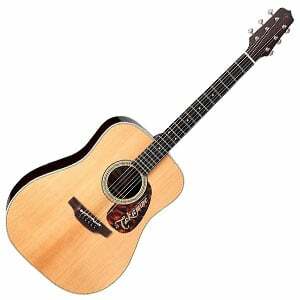 Takamine EF360S-TT Review – Innovative Modern Acoustic or Awesome Antique? Takamine’s innovative EF360S-TT is one of a handful of models in the TT – or ‘Thermal Top’ – Series, which offers the tonal benefits of well-aged woods without the long wait. Sounds pretty good! But, for an acoustic that comes in at under $2,000, it has to tick a few more boxes to be worthy of that hefty sum. So, the big question: does it do the job? Before we discuss the wood, let’s take a moment to admire the overall style of the Takamine EF360S-TT. It’s actually very traditional in its design, with a typical non-cutaway dreadnought body shape and not too much in the way of decoration. It features a faux tortoiseshell pickguard and ivoroid binding for a clean, classic vintage look, which is all-round very appealing. Onto the woods, while the back and sides are crafted from solid Indian rosewood (for an American mahogany version, try the EF340S-TT), the top is a ‘solid Thermal Top’, which is spruce that’s been baked for some time in a controlled high-heat, low-oxygen environment. As well as giving the wood a more vintage, darker look (it’s almost cedar on first glance), this process results in a fuller, richer tone. More on this below. Finally, the EF360S-TT also features a fast-playing mahogany neck, with an ebony fretboard and a total of 20 frets (14 in the clear). Takamine actually sticks with the vintage theme very well when it comes to hardware. Of course, the addition of electronics is pretty modern, but by using their Palathetic pickup and the nearly invisible TLD-2 line driver preamp, they impact the overall look incredibly little. A good inclusion that may not be the most versatile of systems, but still offers a bit of onboard control. Also, in keeping with the vintage look, is the set of open-geared tuners, which feature butterbean tuning keys that are functional and hold tuning stability well. The EF360S-TT comes with a good-quality hardshell case, which is a necessary addition to protect and transport this excellent acoustic. There’s certainly some character and soul to the sound of the EF360S-TT, which must be down to the quality of the build and the aged top, which does really deliver that rich, opened-up tone guitarists crave. The classic spruce and rosewood pairing keeps things well-balanced and articulate, but the instant feeling is one of warmth. This warmth is replicated accurately and naturally through the Takamine electronics, with a plugged-in tone you’d be happily seen with – or heard with, rather – on stage. The Japanese brand have done it again, and produced an excellent high-end guitar that delivers on sound, style and playability. For any acoustic guitarist with a penchant for vintage the Takamine EF360S-TT would be a winner, and something you’d play with confidence – whether chilling on the front porch or performing to a full auditorium. For more info about the Takamine EF360S-TT, click here.